Mara has been trained by the League of Assassins, she knows many martial art forms and can defeat or hold her own against multiple opponents, armed opponents or skilled hand-to-hand combatants. She has been trained in the arts of stealth, throwing weapons and she is also an expert swordswoman. Weapon: Mara carries a curved sword. Mara al Ghul was the daughter of Dusan al Ghul, also known as the White Ghost. Dusan was the son of Ra's al Ghul, an immortal eco-terrorist who lead the group known as the League of Assassins. When Mara was young her father perished, leaving her to be raised by her grandfather Ra's. Mara was trained by Ra's from the day she could clench a fist to become one of his deadliest agents. She was trained in the Black Citadel of Infinity Island, the headquarters of the League. Mara had a competitor, Damian Wayne, Mara's cousin and the son of Dusan's sister Talia al Ghul and the Batman of Gotham City. Damian was superior to Mara in almost every way, and was chosen by Ra's to be his successor due to his less tainted blood. 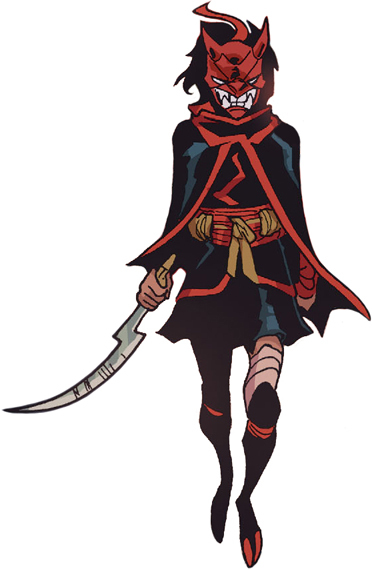 Damian was also chosen to lead the Demon's Fist, a group of powerful and skilful younglings destined to become the greatest members of the League. Mara eventually became envious of her cousin's skill and fortune, which soon turned into hatred after Damian blinded her right eye in a training excursive. Damian soon left the League, joining his father in Gotham City as the new Robin. With Damian gone, Mara was given command of the Demon's Fist, leading her to believe she would inherit the command of the League. The Demon Fist's membership roster included Nightstorm, Plague, Stone, and Blank. On their thirteenth birthdays, the Demon's Fist were destined to choose a target for execution, once this target was eliminated the children would be accepted into the League of Assassins.